Phillips Brewing out of Victoria has started a new Homebrew competition named the ‘King of the carboy’. The winning brew is then mass produced in a one off limited release. This years winner was Eric Jourdan. 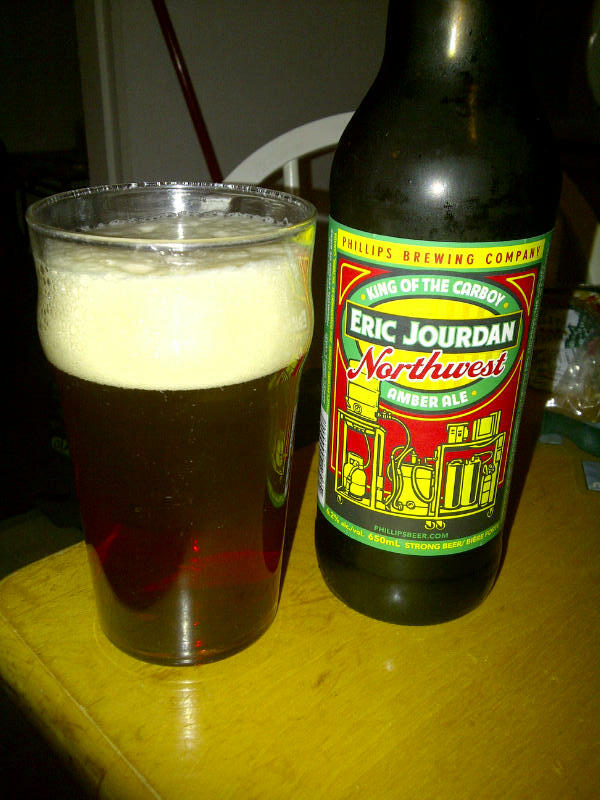 Eric’s brew was called “Eric Jourdan’s Northwest Amber Ale”. The beer pours a deep amber colour with an off white head. The aroma consists of pine, floral hops and some citrus hidden in there. The flavour is of pine, citrus and a good hit of floral hops. The alcohol content of this brew is 6.2%. I would be proud to call this brew my own if I actually home brewed! Commercial Description: Who says you need a brewery to make great beer? Eric Jourdan is one of the winners of CAMRA Victoria’s Home Brew Competition, and won the opportunity to come into Phillips and brew his creation in our brewhouse! His home brewed Northwest Amber Ale is a testament to brewing skill whether your brewhouse is in a brewery or a basement. This entry was posted in Amber Ale and tagged ale, amber ale, bc, beer, camra, canada, citrus, eric jourdan, floral hops, homebrew, homebrew contest, king of the carboy, pine, victoria. Didn’t seem like much of an amber but I still really enjoyed this beer! ya I agree. It was good but not quite as advertised.